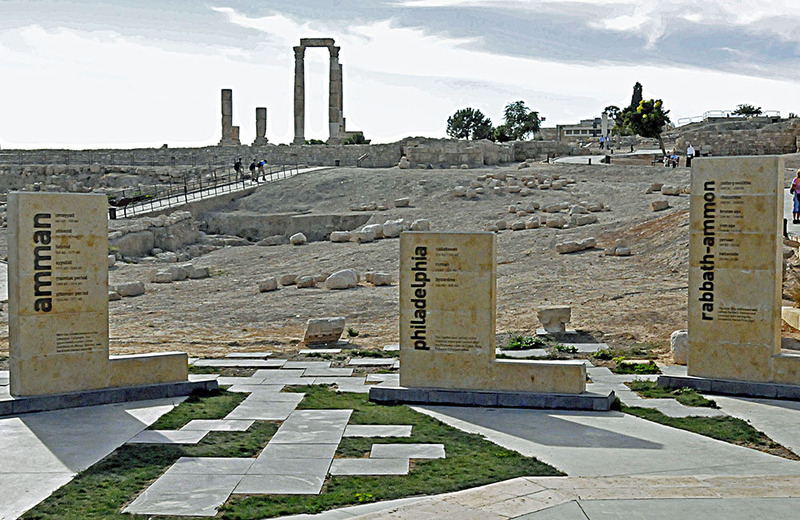 Citadel Hill, the highest of Amman’s seven hills, includes evidence of human occupation since 7,000 B.C., making it one of the world’s longest continuously inhabited sites. At the time of Israel’s King David, a hilltop citadel defended an Ammonite city called Rabbath-Ammon. According to the Bible, Uriah the Hittite was among the Israelite troops besieging the fortress when David, remaining behind in Jerusalem, seduced Uriah’s wife, the beautiful Bathsheba. David then ordered Uriah to the front lines where, as David had hoped, an archer perched on the citadel wall killed Uriah with an arrow. David took Bathsheba as his wife and, after belatedly joining the battle, captured Rabbath-Ammon to join the previously-captured Kingdom of Moab on the eastern edge of his United Monarchy.